The UK is in the midst of an unprecedented peacetime slowdown in productivity growth, which comes on top of the nation’s long-standing productivity weakness compared to the USA, France and Germany. If this trend continues, UK living standards will continue to stagnate and the government’s ambition to eliminate the deficit will fail. Productivity growth is connected with innovation, in its broadest sense, so it is natural to explore the connection between the UK’s poor productivity performance and the low R&D intensity of its economy. More careful analyses of productivity look at the performance of individual sectors and allow some more detailed explanations of the productivity slowdown to be tested. The decline of North Sea oil and gas and the end of the financial services bubble have a special role in the UK’s poor recent performance; these do not explain all the problem, but they will provide a headwind that the economy will have to overcome over the coming years. In response, the UK government will need to take a more active role in procuring and driving technological innovation, particularly in areas where such innovation is needed to meet the strategic goals of the state. We need a new political economy of technological innovation. The UK’s Office of National Statistics today released the latest figures for labour productivity, to the end of 2015. This shows that the apparent recovery in productivity that seemed to be getting going half way through last year was yet another false dawn; productivity has flat-lined since the financial crisis, with the Q4 2015 value actually below the peak achieved in 2007. This performance puts us on track for the worst decade in a century. Poor productivity growth translates directly into stagnating living standards and lower tax revenues for the government, meaning that, despite austerity, all their efforts to eliminate the fiscal deficit will be in vain. 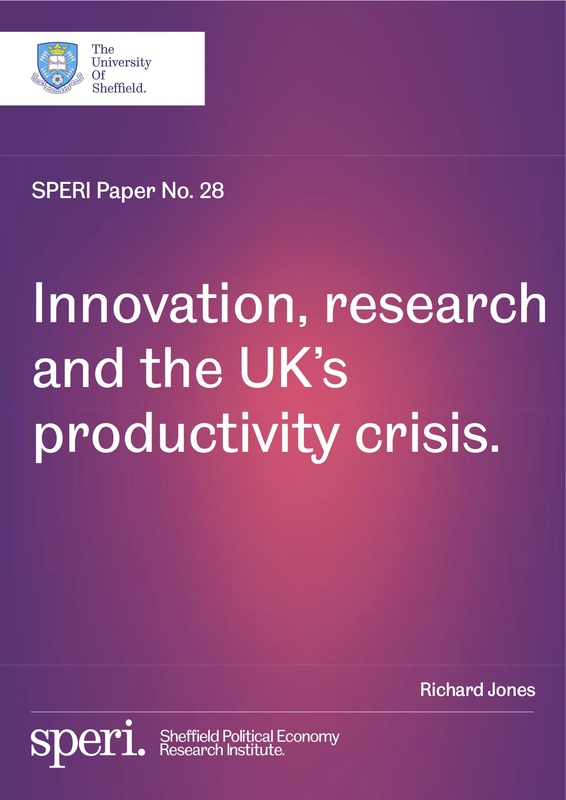 Innovation, research, and the UK’s productivity crisis (1.4 MB PDF). Labour productivity: output per hour. 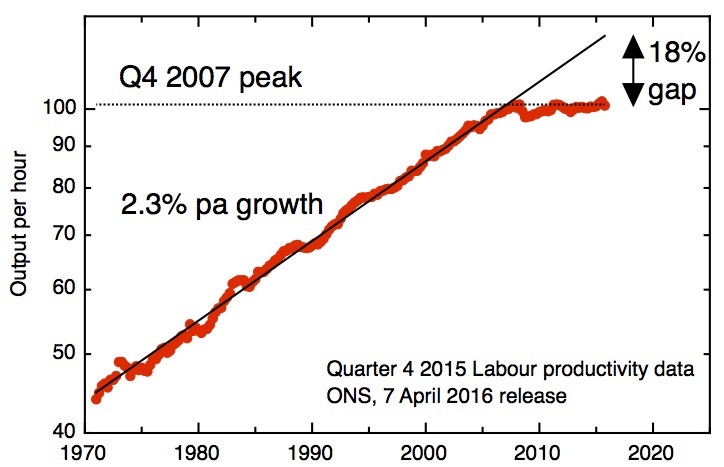 ONS Labour Productivity Dataset, 7 April 2016. It’s about three months since I released my free ebook “Against transhumanism: the delusion of technological transcendence”, and I’m pleased to see from my log files that since then it’s been downloaded more than 10,000 times (many of these may, of course, be repeat customers, or indeed sentient bots roaming the web looking for laughs). I’m grateful to many people for recommendations on blogs and twitter, and I should give special thanks to Dale Carrico, whose original suggestion it was to put the e-book together, and on whose own arguments chapter 5 in particular draws heavily. A review from transhumanist Giulio Prisco finds a surprising amount to agree with, and some interesting comments below the line. There was a generous review from the economist Diane Coyle: The future is multiple, not singular; she describes the book as “a brief, compelling demolition of the idea that digital technology is hurtling us towards a ‘singularity’”. The e-book was the subject of an interview with Russ Roberts on EconTalk, which over the course of more than an an hour covered transhumanism, brain uploading, the concept of emergence in physics, economics and biology, and the economics of technology and innovation more generally. There my insistence on the importance of government intervention for radical innovation collided with my interviewer’s position favouring small government and free markets. 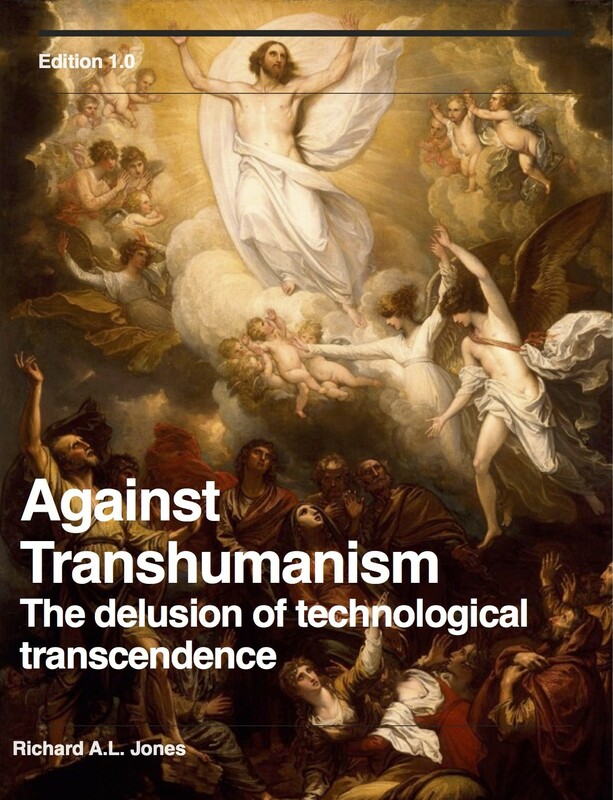 Against Transhumanism, v1.0 (PDF 650 kB). The UK was the country in which mass production of steel began, so the current difficulties of the UK’s steel industry are highly politically charged. For many, it is unthinkable that a country with pretensions to be an economic power could lose its capacity to mass produce steel. To others, though, the steel industry is the epitome of the old heavy industry that has been superseded by the new, weightless economy of services, now supercharged by new digital technologies; we should not mourn its inevitable passing. So, is steel irrelevant, in our new, dematerialised economy? Here are two graphs which, on the face of it, seem to tell contradictory stories about the importance, or otherwise, of steel in modern economies. The “steel intensity” of the economy of the USA – the amount of steel required to produce unit real GDP output (expressed as 1000’s of 2009 US dollars). It’s been an interesting week in UK politics. On Wednesday the Chancellor of the Exchequer delivered a budget against the backdrop of an economic situation much worse than it seemed last November, at the time of his Autumn Statement. At the heart of the bleak economic news was disappointment about productivity – the Office of Budgetary Responsibility (the OBR) downgraded its forecasts for future productivity growth; as a result their forecasts for tax income went down, so to meet the government’s self-imposed targets on deficit reduction further spending cuts had to be pencilled in. Among those spending cuts were cuts to the allowances to disabled people – the political fall-out from which we’re still seeing. 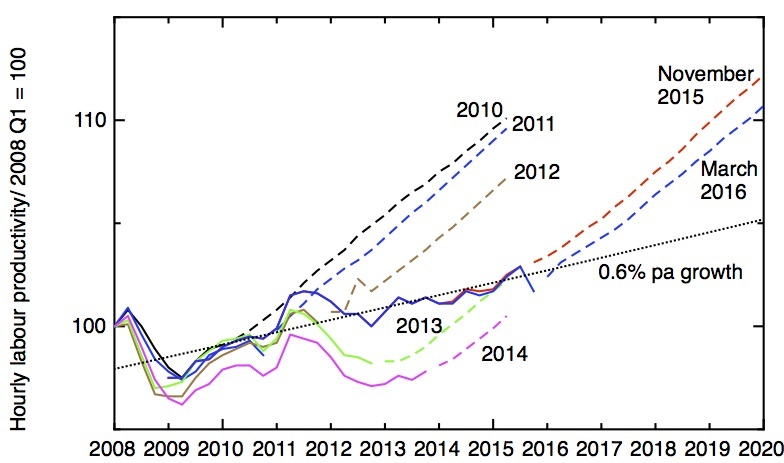 Labour productivity according to the successive Office of Budgetary Responsibility’s Economic and Fiscal Assessments for the years indicated, showing estimates of productivity up to the time of publication of each report (solid lines), and predictions for the future (dotted lines). The dotted line is best fit to the post 2009 trend, representing 0.6% annual growth. Data for 2010-2014 from the October 2015 OBR Forecast Evaluation Report, for 2015 and 2016 from the March 2016 OBR Economic and Fiscal Outlook. Robert Gordon’s book “The Rise and Fall of American Growth” comprehensively describes the fall in productivity growth in the USA from its mid-twentieth century highs, as I discussed in my last post. Given the book’s exclusive focus on the USA, it’s interesting to set this in a more international context by looking at the data for other developed countries. My first graph shows the labour productivity – defined as GDP per hour worked – for the G7 group of developed nations since 1970. This data, from the OECD, has been converted into constant US dollars at purchasing power parity; one should be aware that these currency conversions are not completely straightforward. Nonetheless, the picture is very clear. On this semi-logarithmic plot, a constant annual growth rate will produce a straight line. Instead, what we see is a systematic slow-down in the growth rate as we go from 1970 to the present day. I have fitted the data to a logistic function, which is a good representation of growth that starts out exponential and starts to saturate. In 1970, labour productivity in the G7 nations was growing at around 2.9% annually, but by the present day this had dropped to an annual growth rate of 1.2%. Labour productivity across the G7 group of nations – GDP per hour worked, currencies converted at purchasing power parity and expressed as constant 2010 US$. 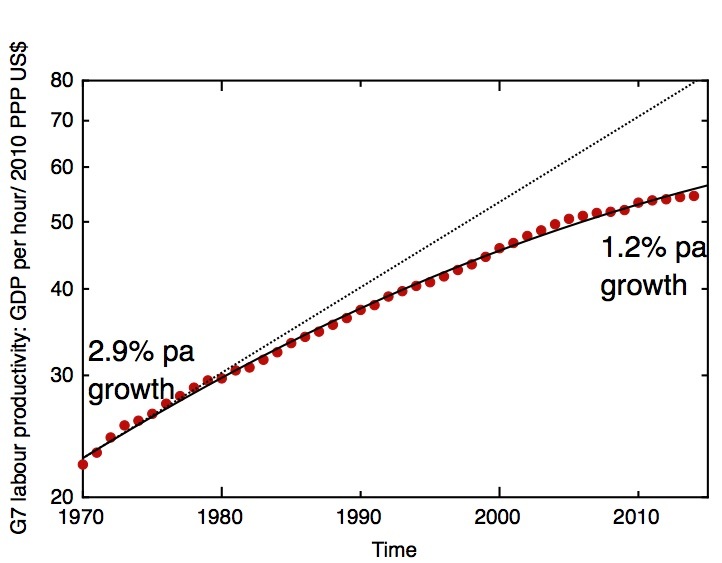 The fit (solid line) is a logistic function, corresponding to an annual growth rate of 2.9% in 1970, dropping to 1.2% in 2014. OECD data. The second graph shows the evolution of labour productivity in a few developed countries as expressed as a fraction of this G7 average. Both at the beginning of the period, in 1970, and at the present day, the USA is the world’s productivity leader, the nation at the technology frontier. But the intervening period saw a long relative decline through the 1970s and ’80s, and a less dramatic recovery. The mirror image of this performance is shown by France and Germany, whose labour productivity performances have marched in step. France and Germany’s relative improvement in productivity performance took them ahead of the USA on this measure in the early 1990’s, but they have slipped back slightly in the last decade. The UK, however, has been a persistent productivity laggard. Its low point was reached in 1975, when its productivity fell to 17% below the G7 average. After a bumpy performance in the 1980s, there was a slow improvement in the ’90s and ’00s, but much of this ground was lost in the financial crisis of 2008, leaving UK productivity around 13% below the G7 average, and 24% below the world’s productivity leader, the USA. It is Italy, however, that has had the most dramatic evolution, beginning the period showing the same improvement as France and Germany, but then enduring a long decline, to end up with a productivity performance as poor as the UK’s. What’s happening to the economy of the USA? Is change accelerating, are we entering a new industrial revolution based on artificial intelligence and robotics, as the techno-optimists would have it it? Or is the USA settling down into a future of slow economic growth, with technological innovation declining in pace and impact compared to the innovations of the twentieth century? The last is the thesis of economist Robert Gordon, set out in a weighty new book, The Rise and Fall of American Growth. The case he sets out for the phenomenon of stagnation is compelling, but I don’t think his analysis of the changing character of technological innovation is convincing, which makes him unable to offer any substantive remedies for the problem. The Rise and Fall of American Growth. 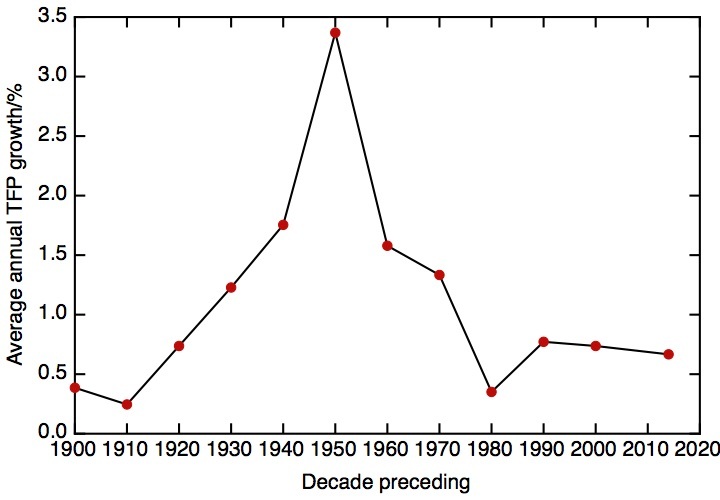 The average annual growth of total factor productivity – that part of economic growth not accounted for by increased inputs of labour and capital – over each decade leading up to the given date (14 years in the case of 2014). 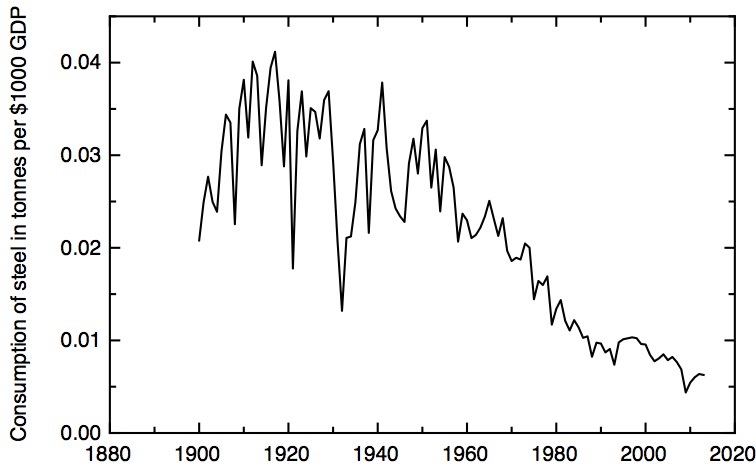 Data from R.J. Gordon, replotted from figure 16-5 of his book The Rise and Fall of American Growth. The fourth industrial revolution – this time it’s exponential! The World Economic Forum at Davos provides a reliable barometer of conventional wisdom amongst the globalised elite, so it’s interesting this year that, amidst all the sage thoughts on refugee crises, collapsing commodity prices and world stock market gyrations, there’s concern about the economic potential and possible dislocations from the fourth industrial revolution we are currently, it seems widely agreed, at the cusp of. This is believed to arise from the coupling of the digital and material worlds, through robotics, the “Internet of Things”, 3-d printing, and so on, together with the development of artificial intelligence to the point where it can replace the skill and judgement of highly educated and trained workers. This succinctly summarises conventional wisdom, but almost every word of this statement is questionable or wrong. Author Richard JonesPosted on January 24, 2016 April 5, 2016 Categories Science policy1 Comment on The fourth industrial revolution – this time it’s exponential! As an experiment, I’ve brought together a number of the pieces I’ve written here and elsewhere about molecular nanotechnology, mind-uploading, and the origins and wider implications of transhumanism, to make, after some light editing, a 54-page e-book with the title “Against Transhumanism: the delusion of technological transcendence”. Against Transhumanism, v1.0 (PDF 7.1 MB). Perhaps no single number is more important to the world economy than the price of oil. Modern economies depend on energy, and oil remains our largest energy source, supplying 31% of the world’s energy needs (another 21% comes from gas, whose price now moves quite closely with oil). And yet, huge movements in this number seemingly take experts by complete surprise. The price of oil in constant 2008 dollars, compared with the US Energy Information Authority predictions from 2000 and 2010. Data from the EIA. My graph shows how the price of oil, corrected for inflation, has changed in the last 45 years. 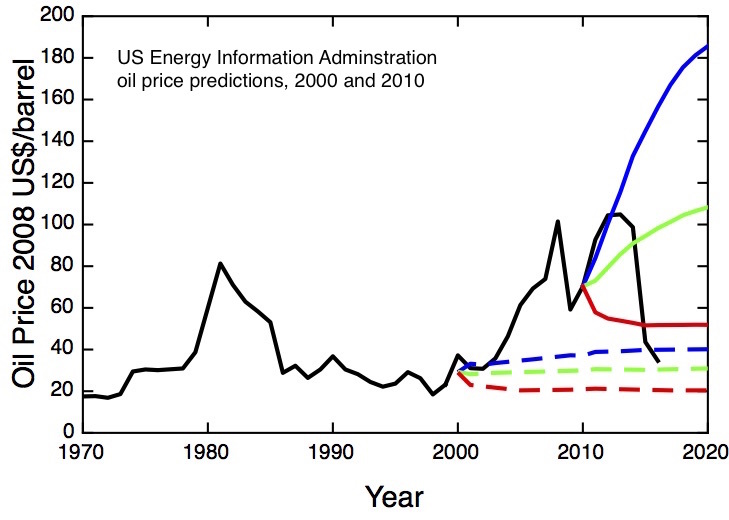 This is an updated version of the plot I blogged about five years ago; I included the set of predictions that the US Energy Information Administration had made in 2000. Just a few years later, these predictions were made nugatory by a large, unanticipated rise in oil prices. The predictions the EIA made ten years later, in 2010, had learnt one lesson – they included a much bigger spread between the high and low contingencies, amounting to more than a factor of three by the end of the decade. Now, only halfway into the period of the prediction, we see that the way oil prices turned out has so far managed both to exceed the high prediction and to undershoot the low one.